Well-known for its foil type of shavers Braun has yet again come up with a sleek shiny black electric shaver. It looks like a premium product even though the price is much lower. The Braun Series 3 390cc is for both wet and dry shaves. With its foil type shavers, the Series 3 390cc gives you 30% less skin irritation when compared to rotary style shavers. 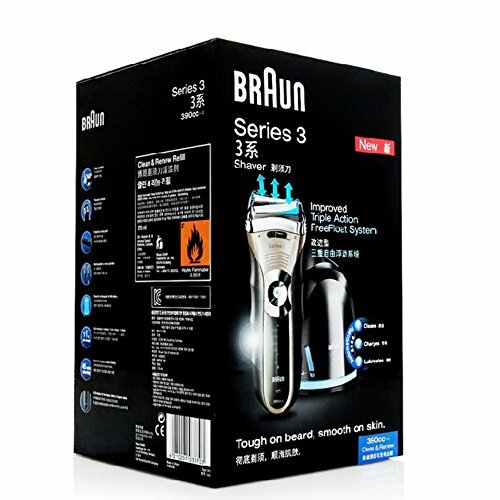 Braun Series 3 390cc is a good fit for those who don’t have bushy beard. Being a foil-type electric shaver, it uses rapidly vibrating blades that are covered by rectangular strip of finely perforated foil. When these pass over your face, the hair gets trapped in these perforations and then the blades cut them off. Foil type shavers are known for close, quick and precision. Features Men Love About It! The Series 3 390cc is equipped with two foils with an independent trimmer in the middle. The trimmer mows down the longer and difficult hairs while the two “SensoFoil” foils capture and cut short ones. 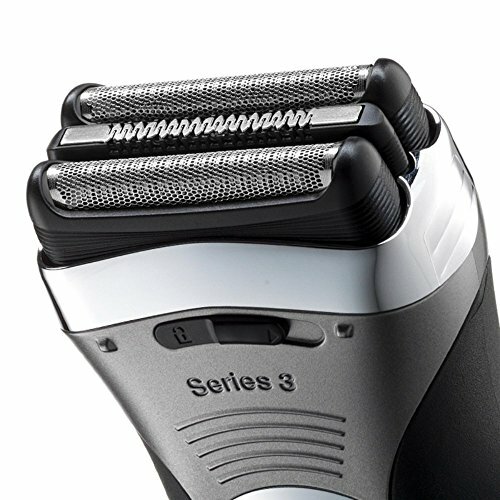 This Series 3 390cc can handle a beard of 3 days with ease. These optimized foils make your shaving experience so comfortable. Being completely waterproof, you can rinse this under the water quickly. Do note that the Braun 380s-4 and Braun 340s-4 can easily be use when taking showers. This can give you both wet and dry shaves. You can use anything that you like such as shaving gels, foams or creams to get an irritant free shave. The Series 3 390cc does a great job in leaving your face smooth. It glides smoothly and gently across your skin. Being completely waterproof you can directly rinse it under running water so cleaning manually is also easy. The precision trimmer that comes with the Braun Series 3 390cc is perfect when it comes to shaping the side burns. With a round head and a pop-up mechanism, it is easy and convenient to use. Being waterproof it is very easy to use and handle even when taking showers. Braun is the first one to come up with alcohol-based cleaning and charging stations. Since alcohol will destroy 99.999% of bacteria you are assured of a good sanitized and hygienic shave every time you use it. With its clean and charge station, you don’t have to worry about anything. It not only cleans but also lubricates the blades for better performance during every shave. Every cleaning session will restore the shaver to a like new condition. It’s a very simple device to use. The solution also has a lemony scent giving you that fresh feeling with every shave. You just need the cleaning cartridges which are replaceable for better performance and an extended life. Each cartridge will last around 2-3 months depending on use. The shaver comes with a high capacity Ni-MH rechargeable battery, that when charged lasts for an hour and gives you a run time of 45 minutes. It’s also equipped with a 5-minute quick charge feature. The LED indicator will let you know when your shavers is out of charge and lets you know about the hygiene status of the electric shaver. The Braun Series 3 390cc is neither too large nor too small for your hands. Very easy to hold and manipulate. 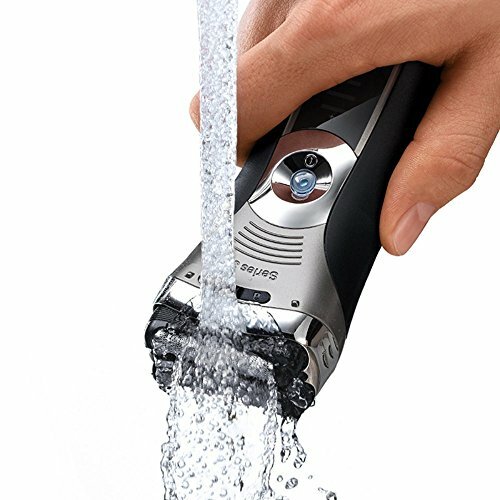 Rubberized grip makes it possible to hold the shaver comfortably even with wet hands. The pricing of Braun Series 3 390cc makes it affordable especially when you get both the cleaning and charging station along with the electric shaver. The packaged box includes Braun Series 3 390cc electric shaver, an attached pop-up trimmer, clean and renew system, cleaning brush, SmartPlug 100v to 240v charger, one clean and renew cartridge and a travel pouch. If you travel a lot, then this SmartPlug is helpful as it is equipped with dual voltage technology you can use in outlets all over the world without a voltage adapter. This is an ideal shaver for those with sensitive skin or for those who are thinking about changing from manual to electric razor. If you want to compare this one to other Braun Shavers check out my comparison chart here. 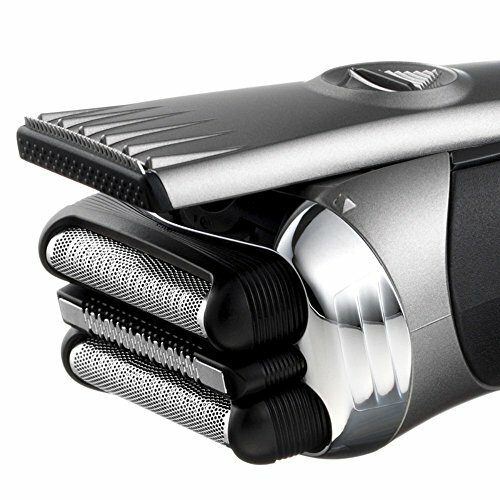 It is recommended that you replace the shaver head every 18 months. There is a replacement part indicator on the front of the display unit ion the shaver to alert you when it is time to replace its head. The Braun Series 3 390cc is quality electric shaver at an incredible price. At the same price you won’t find anything better than this. A solid, top rated performer that is quick and effective at the same time. If you don’t want to compromise on quality, precision and durability then Braun Series 3 390cc is the perfect pick for you.